Low Glow is useful, but sometimes you need something brighter. 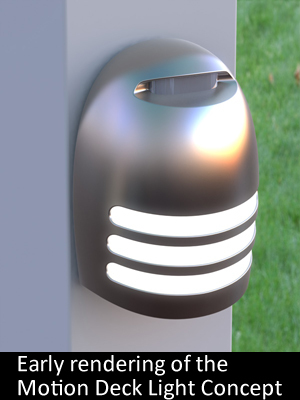 When we completed the Deck Marker Light we realized that there was a wider range of other applications we could fulfill if we could offer more light. Still, we believe that in order to be useful battery products need to run for one, two or even three years between battery changes. The logical answer to match light output and battery life expectations seemed to be combining the light with a motion sensor. Motion sensing is one of Chief Electrical Engineer Kim McCavit’s strongest competencies. 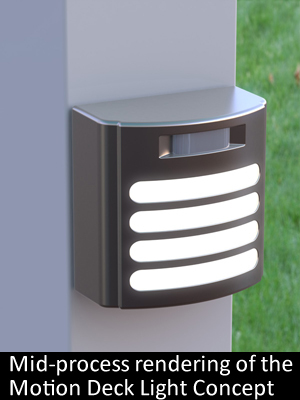 The entire design of the Motion Deck Light began with his sensor and the goal of creating something as reliable as a motion sensing security light. This meant getting as wide an angle as possible without sacrificing sensitivity. It also meant a great deal of effort went in to protecting the sensor from water damage and air currents that create false triggers. As part of our water resistance testing we put our prototypes in the office shower for hours at a time. The products always survived undamaged, but the test proved a bit disconcerting for our accountant, Lisna. Unaware of the test, Lisna went into the bathroom to find the lights off, the shower running, and no one in sight. With the fundamentals of the motion sensor in place, the problem became wrapping a product around the requirements of the sensor lens. Mark Goldy, our mechanical engineer, began shaping a product that kept the family resemblance with the Deck Marker Light. Late in this process John, president of Xodus Innovations, suggested using the lights in public spaces such as the community mailbox area in his neighborhood. Mark managed to find a little last minute wiggle room in the design, and squeezed in a security screw that could be used to make the light harder to remove. Our original thought for the light’s motion activated bright mode was to simply brighten the LED that was already providing the Low Glow effect. We tested this idea, but the light produced an unpleasant glare that was more likely to blind a user than light their way. We then came up with the concept of hiding a second LED on the underside of the product, casting a pool of light on the ground. This immediately eliminated the glare and produced an extraordinary level of useful, efficient light. As we ran through design iterations we began making choices about brightness and duration versus battery life. Would it be more useful to have the product be a little brighter, or should it last a little longer? Ultimately we decided that we wanted to put these choices in the hands of the user. We added controls for selecting the brightness and duration of the bright mode, giving the customer the option to decide what is most important to them. We crunched the numbers and realized that a customer focused on battery life could conceivably get as much as three years of use out of the product. And while a customer using it for something like primary lighting on a heavily used deck might only get a season, they would be guaranteed to have plenty of light filling the space. While the original Deck Marker Light certainly still has its place, it has been extremely satisfying to bring the next generation to market. The new set of features and capabilities contained in the Motion Deck Light clearly embody the kind of robust and versatile design we always want to bring to our customers. Want to see more? 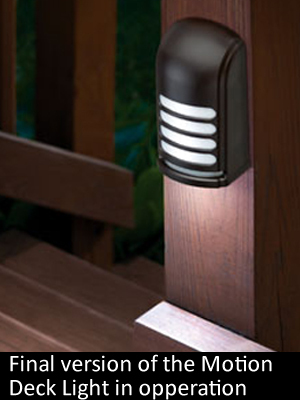 Visit the Motion Deck Light product page.